Get started with Wowza Streaming Cloud We hope it is easier for you to find articles about the Wowza products, services, and developer tools you use. Leave a comment and let us know what you think. Wowza Streaming Cloud lets you easily stream live video to any device, scaling automatically to accommodate audiences of any size, anywhere. Wowza Streaming Cloud accepts video from nearly any encoder or IP camera, transcodes that video in the cloud, and delivers a high-quality stream in multiple bitrates that can be watched in a customizable player on virtually any device. You don't have to purchase or maintain hardware, or install or run software locally. You pay only for the resources you use, and broadcast to audiences large or small, any time. Using a simple, browser-based interface, tell Wowza Streaming Cloud what you're using to capture and encode your video and specify your playback options, then let Wowza Streaming Cloud do the rest of the work. Wowza Streaming Cloud provides you with the information you need to connect with your source encoder and for your viewers to watch the stream, and then it performs adaptive bitrate transcoding in the cloud by using the robust, reliable technology you've come to expect from Wowza. Advanced settings let you create custom transcoding workflows, receive live streams to selected Wowza Streaming Cloud sources, and send streams to multiple targets, offering the control and scalability required for large-scale, professional deployments. Note: For information on the Wowza Streaming Cloud free trial and its feature limitations, see Wowza Streaming Cloud free trial. You can sign in to Wowza Streaming Cloud by using any modern web browser that supports HTML5 and Cascading Style Sheets level 3 (CSS 3). The Wowza Streaming Cloud user interface has been most extensively tested on Google Chrome, however, so for best results we recommend that you use the latest version of Google Chrome. Click Launch Wowza Streaming Cloud when you complete your purchase in the Wowza portal. Sign in using your Wowza credentials. Welcome to Wowza Streaming Cloud. Home – Provides links to useful documentation and displays graphs that depict recent traffic and usage. On the left are panels that display Recent streams and Recent Activity. On the right are panels with Current Usage information and What's New announcements. Live Streams – Lets you create, edit, start, stop, schedule, and record live stream broadcasts. Monitor – Provides a quick view of the health of active streams. Advanced – Offers options to customize your transcoding setup, to receive video to specific Wowza Streaming Cloud stream sources, and to deliver output renditions to multiple stream targets. You can also view and manage recordings, schedules, and user activity logs. Username – Lets you view usage information for the account, go to your account details in the Wowza portal, switch to a different workgroup, and sign out of Wowza Streaming Cloud. Help – Provides links to documentation, articles, and Support resources. Note: The Wowza Streaming Cloud manager menu bar adjusts for mobile devices and as you resize your browser window. In smaller windows or screens, only the icons are visible. A live stream is a single, linear video broadcast. 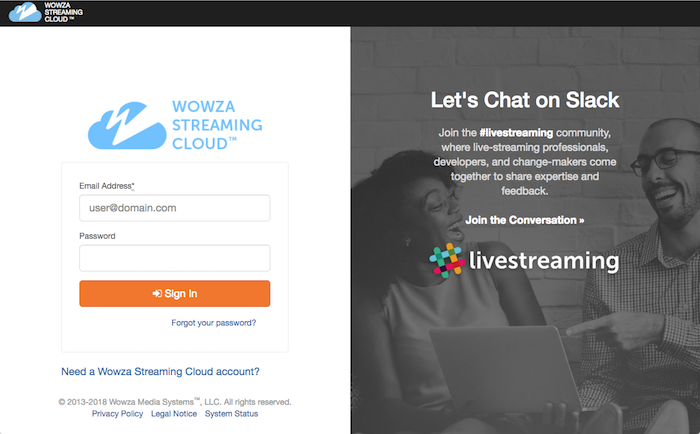 You broadcast a live stream by receiving encoded source video into Wowza Streaming Cloud and letting Wowza Streaming Cloud transcode the stream and deliver it to viewers. Each live stream has a name, specifies how the video source connects with Wowza Streaming Cloud, and defines the playback method that allows viewers to watch the stream. To create a live stream, click Live Streams on the menu bar, click Add Live Stream, and then complete the five steps to add the stream. Click Next to advance to the next step; click Back to return to a previous step. Most settings can also be changed after the live stream is created. Note: The Help panel provides details about the options that need to be configured on each page. Click Hide Help to hide the information or click Show Help to bring it into view. The Live Stream Name, which is required, should be short and descriptive. The Broadcast Location is where Wowza Streaming Cloud transcodes your stream. By default, the Broadcast Location is set to your browser's time zone. Choose a Broadcast Location that's as close as possible to the video source and supports the features you want to use. Note: Pay-as-you-go billing and adaptive bitrate transcoding are supported in all locations. 24x7 billing, passthrough transcoding, and 4K streaming, however, aren't universally supported. See the tags on the Broadcast Location tiles to help you select a location that supports the features you want to use, and see Wowza Streaming Cloud broadcast location features and addresses to compare feature availability at different locations. Video Source and Transcoder Settings. Wowza Streaming Cloud needs to know the camera or encoder you'll be using. Choose Wowza GoCoder for this quick start tutorial. For more information about the Gocoder encoding app for iOS and Android devices and to download the app, visit the Wowza GoCoder page. Note: Wowza Streaming Cloud accepts a number of different video sources in addition to the Wowza GoCoder mobile app. See Prepare and Connect Video Sources for options and configuration information. Then, specify the Delivery Protocol, which is the protocol used to deliver the stream to viewers. You can choose Apple HLS or Apple HLS and Adobe HDS. Wowza Streaming Cloud generates playback URLs for the protocol or protocols you choose. Do not select Yes, create an HLS stream with reduced latency. Most live streams don't need this setting. Next, specify the Aspect Ratio and pixel dimensions, or frame size, of the source video. Choosing the correct aspect ratio and dimensions ensures that the video won't be distorted, squeezed, or cropped when it's played. The aspect ratio of widescreen, high-definition (HD) video is 16 divided by 9, or 16:9. The aspect ratio of standard-definition video is 4 divided by 3, or 4:3. Full HD video is 16:9 with a frame size of 1280 x 720 pixels. The higher the resolution of the incoming video, the more bitrate renditions Wowza Streaming Cloud generates. A bitrate rendition is a version of the live stream at a specific frame size and bitrate. Wowza Streaming Cloud automatically creates multiple bitrate renditions, based on the resolution of the source video, to offer the best possible playback experience for a viewer's device and bandwidth. If you have a 24x7 subscription, choose whether you want to run the stream in Pay as you go or 24x7 billing mode. If your subscription and Broadcast Location support passthrough streaming, choose whether you want the stream to be Adaptive bitrate (default) or Passthrough. If you choose Passthrough as your live stream type, Wowza Streaming Cloud does not create adaptive bitrate renditions based on the video source's aspect ratio. If you have a pay-as-you-go subscription and you want Wowza Streaming Cloud to create an MP4 recording of your live stream, select Yes, record this live stream. To omit captions from playback, leave the closed captioning option set at None. Finally, decide if you want to disable authentication. By default, Wowza Streaming Cloud requires a username and password to authenticate connections to certain sources. Select Disable authentication if you don't want to use authentication with your video source. On the Playback Settings page, select the default player, Original HTML 5 player, and then customize it. Note: If you use your own player, the Wowza Streaming Cloud playback settings are disregarded. Player Width – Specify whether the player should be Responsive or Fixed width. A responsive player adjusts in size depending on the device on which it's being viewed. A fixed width player does not. If you choose Fixed width, enter the width, in pixels, for the player. The height is calculated automatically based on the aspect ratio of the video source. The dimensions are used in the player's embed code. Video Poster Image – (Optional) Upload a poster image to appear in the player before the stream begins. To prevent distortion or cropping, make sure the image has the same aspect ratio as the source video. Poster images must be GIF, JPEG, or PNG format and no larger than 2.5 MB. Countdown Clock – (Optional) If selected, a countdown clock appears in the player before the stream begins. If you include a countdown clock, provide the date and time zone of the event. Note: If you display both a poster image and a countdown clock, the poster image appears behind the countdown clock. Player Logo - (Optional) A logo or other partially transparent image that appears in the player before and during playback. Upload a logo or other image file that's GIF, JPEG, or PNG format and no larger than 2.5 MB. Then, specify the corner of the player to which you want to anchor the logo. Tell Wowza Streaming Cloud if you want it to host a webpage that plays your video. Note: If you choose to not have a hosted page when you create the live stream, you can't add one afterward. Select Yes to have Wowza host a webpage with the video player. Select No to manage video playback yourself. If you don't use a hosted Wowza Streaming Cloud page, you can either embed the player on your own webpage or use your own player. When you finish creating the live stream, Wowza Streaming Cloud provides you with the embed code and playback URLs you need for those playback methods. Hosted Page Logo – (Optional) A graphical logo of your choosing that appears above the player. The logo file must be GIF, JPEG, or PNG format and no larger than 2.5 MB. Wowza Streaming Cloud resizes the image to fit the space on the page. Sharing Links – If selected, the hosted page displays buttons that let viewers quickly share the video on Facebook, Google+, Twitter, other social-media sites, and by email. Sharing-link buttons appear below the player and below the Hosted Page Description, if there is one. Finally, review your choices. If necessary, click Back or click the Live Stream Setup, Video Source and Transcoder Settings, Playback Settings, or Hosted Page Settings icons to edit your selections. Click Finish when your settings are correct. Wowza Streaming Cloud creates your live stream and displays the Overview tab of the live stream detail page. Now that your live stream has been added to Wowza Streaming Cloud, configure the Wowza GoCoder™ mobile app to connect to Wowza Streaming Cloud. 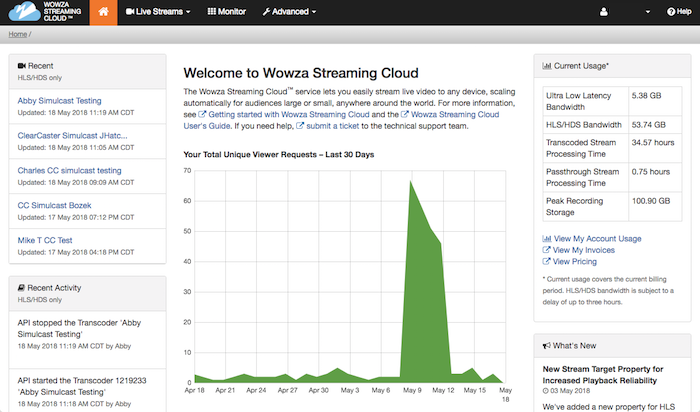 On the Live Streams page in Wowza Streaming Cloud, select the stream that uses Wowza GoCoder as its video source. Start the GoCoder app on your mobile device. Tap the Video Server icon. Enter the Connection Code from the Overview tab of your live stream detail page. 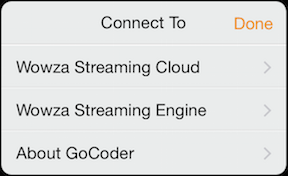 For more detailed instructions, see How to connect Wowza GoCoder to Wowza Streaming Cloud. For more video source options, see Prepare and Connect Video Sources. Next, configure the player and the webpage that are hosting your live stream. Select the stream on the Live Streams page to open the Overview tab of the live stream detail page. If you're using a Wowza Streaming Cloud player in your own webpage, use the Player Embed Code to include the player on your webpage. If you're using your own player, copy the Playback URLs into your player settings. Wowza Streaming Cloud provides URLs for Adobe HDS playback using Adobe Flash Player and Adobe AIR, and Apple HLS playback for playing video on iOS devices, in QuickTime Player (version 10 or later), in the Safari web browser, and on HLS-compatible set-top boxes and smart TVs. Adobe HDS playback URLs work only with players that support the Akamai HDCore ActionScript Library. For more information, see Use Adobe HDS playback URLs from Wowza Streaming Cloud in third-party players. Click the Hosted Page tab. If you're using a Wowza Streaming Cloud–hosted page for video playback, give viewers the Hosted Page URL so they can watch the event. Now you're ready to stream. In Wowza Streaming Cloud, select the stream on the Live Streams page, and then click Start Live Stream at the top of the live stream detail page. Wowza Streaming Cloud asks you to confirm that you want to start the stream and then opens it and connects with your video source. When the live stream starts, the Video Thumbnail appears on the Overview tab of the live stream detail page. The thumbnail from the live stream updates every five seconds. Below the thumbnail, a date/time stamp indicates when the stream began. 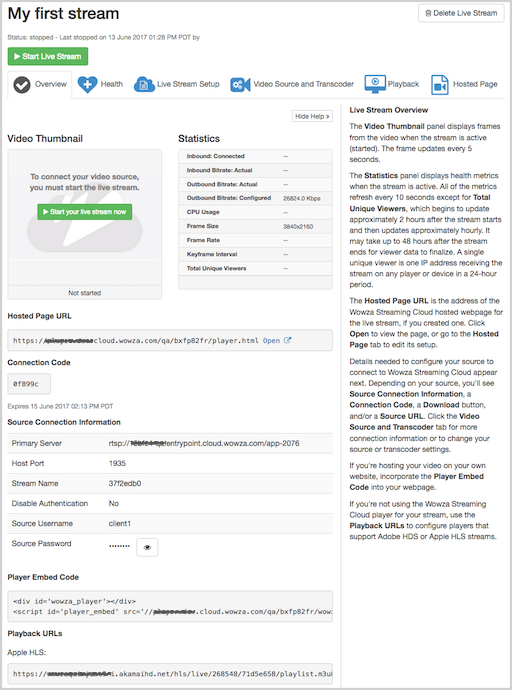 Connection, transcoding, and delivery metrics appear in the Statistics panel. Important: Remember to stop your live stream when your event ends: click Stop Stream at the top of the live stream detail page. Transcoding charges accrue for started live streams even if they aren't actively streaming content. Wowza Streaming Cloud automatically stops idle live streams after 20 minutes, but you should stop your stream as soon as your event ends to avoid accruing unnecessary charges.